He was also deeply influenced by the Anonymous Movement, a group of artists in the 1920s who refused to sign paintings: they insisted that works of art must stand on their merits, not on the artist's personality. That quote from David Dunaway's superb biography 'How Can I Keep From Singing: Pete Seeger' continues my innocent ear thread, and that is Pete singing in my header photo. It was an unknown composer who provided the name for a well-known female vocal ensemble. 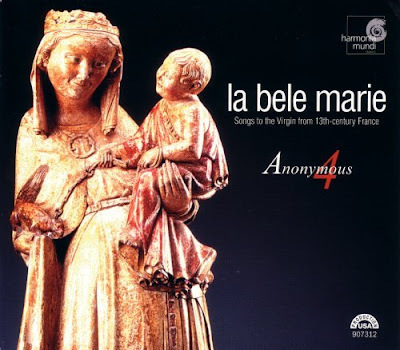 Anonymous 4 are named after an unidentified thirteenth-century composer who was given that designation by nineteenth-century musicologist Charles-Edmond-Henri de Coussemaker. In an interesting twist on Pete Seeger's views on works of art standing on their merits, one view is that the anonymous composer was a woman. The sleeve sample below is from one of my favourite Anonymous 4 discs (audio samples via that link) which celebrates another unique Lady. Now read about a little known link between Pete Seeger and Benjamin Britten.